Falooda is a very popular Indian Summer drink and its our favorite drink ever. Just after or in the middle of the shopping in Goa, I never miss to enjoy this drink especially in the small cool joints at Mapusa Market. They prepare very simple rose falooda and thats the best way to beat the heat there. Today I got the chance to prepare this all by myself in my kitchen and enjoy the tall glass of cool Rose Falooda. Thanks to the SNChallenge and Minnie for this wonderful September month challenge for the South Indian team of SNC hosted by Divya Pramil. Here's the recipe of Rose flavored Falooda topped with Vanilla Ice cream. 1. Soak the basil seeds in 1 cup of water for 1 hour or till they have plumped up. 2. Mix the chilled milk and rose syrup+ rose water in a bowl and chill for an hour. 3. Cook the noodles till they become soft. Drain the excess water and keep aside. 4. 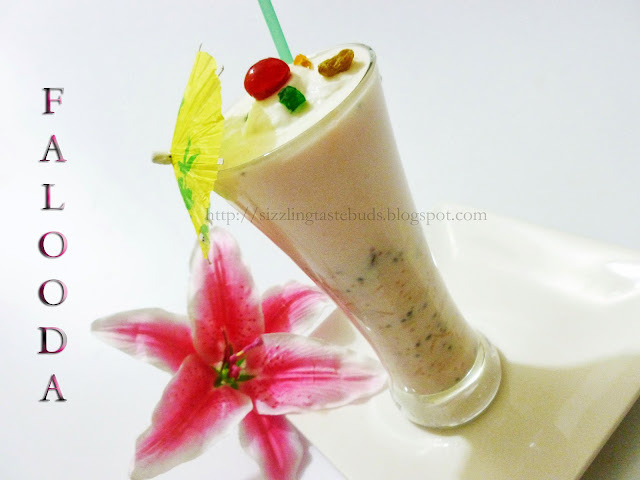 Take a tall glass and add some soaked basil seeds and some cooked falooda noodles. 5. Pour the chilled milk mixed with rose syrup. 6. Top it with a scoop or two Vanilla Ice-cream. 7. 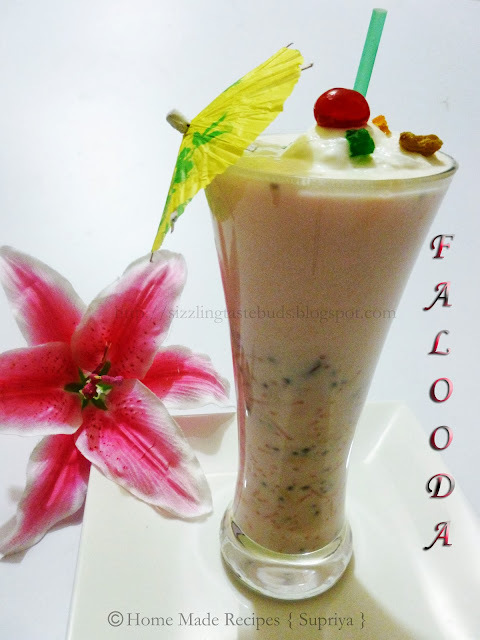 Add some nuts and a cherry on top and enjoy a glass full of delicious Falooda drink. 1. If you want more sweet, drizzle a little more rose syrup. 2. If falooda noodles is not available, you can use normal thin vermicelli noodles. Beautiful glass of falooda :) Glad you liked it. wow such an beautiful glass of falooda :) makes me drool here dear ! !